I think I’m done with carrot cake cookies. Really. This is the last batch and then I’m moving on! Unlike the other carrot cookies which were borderline wholesome and could pass for breakfast, this version is 100% dessert. The recipe was posted on a bulletin board called Mouse Buzz where Disney Vacation Club members chat about all things Disney. A few people mentioned the elusive carrot cake cookies sold at Writers’ Stop and Goofy’s Candy Cauldron and one person who’d actually tried the Disney cookie went home and cloned them. This is her recipe, with a few more changes added by me. Update: After visiting Disney, I finally got to try their carrot cake cookies. These were actually nothing like them! Disney’s were flat (delicious! ), but flatter and denser. However, over the years I’ve gotten used to these puffier, cakey ones, so this is still my go-to recipe. The ones from Bon Appetit are good, too. Preheat oven to 350 degrees F. Line two baking sheets with foil. In a mixing bowl, beat the butter with sugar until creamy. Beat in the eggs and vanilla, then stir in carrots and raisins. Mix the dry ingredients (flour, baking powder, soda, salt and cinnamon) together, then add them to the creamed mixture, stirring just until mixed. Drop by rounded spoonfuls (if you have a medium cookie scoop, it works well) on to the sheets. Sprinkle pecans over half of the cookies. Bake 15 to 20 minutes. Let cool on sheets for a while. When completely cool, sandwich 2 cookies together with the cream cheese filling. Use a pecan topped cookie for the top cookie. Beat the cream cheese, gradually adding the butter. Beat until smooth. Sift in sugar. Beat well. Add pineapple and vanilla. Rub cream cheese frosting over the bottom of half of the cookies and use the remaining cookies to top the sandwiches. Butterfinger Cupcake from Disney's "Starring Rolls"
Hi Anna and all, Total change of subject except that it is related to a sandwich cookie. I’m going to the daughter’s house for the weekend and wanted to try something different plus was trying to clean out the fridge a little bit… My hubby and the dau. love apple pie type stuff. Me-not so much. I made the cookie exactly as written, the one comment on the website was that the cookie turned out soft and mushy. Uh, yeah, I think it was a typo on the oven temp. I changed it to 350 deg. and baked the cookies for 12-14 min. That made more of a crispy/chewy cookie that made sense for a sandwich cookie. The cookies themselves are very tasty (a brown sugar type sugar cookie). Oh and the recipe said to make the cookies marble-sized balls. As a mid-westerner we don’t do small cookies, ha. I made them walnut sized. Don’t go any bigger, they spread out. Here’s were I changed things around–with the filling. I couldn’t find my applebutter (well-hidden in the freezer) so I used home canned apple pie filling. Pureed that in the food processor and had a half cup apple stuff, 1/8 c. sugar, 8 oz. cream cheese. The cookie seemed quite sweet all alone so I figured I wouldn’t need too much in the filling since the apple pie filling was quite sweet. I think it is fine. I added the extra 1/4 c. pie filling cause I wanted a stronger apple taste after I did the original taste test. Be sure to use plenty of filling though for the cookies. Now the serving size-I ended up with 64 single cookies. I can’t imagine how they are only serving 15 in the original recipe. I liked this well enough I plan to make it again. We’ll see what the taste testers have to say about it this weekend. Wow, those look great! I love whoopie pies and Love carrot cake. what a perfect combination. I can’t wait to try them. These are on my list of cookies to bake. To be honest, I’ve never had carrot cake. There’s secretly still a little bit of the 8 year old inside on me who would never touch a vegetable, especially in a baked good. But I would pretty much only eat chicken tenders and straight up chocolate chip cookies, so at least I’m improving. It’s been a hard process. Oh yum! I’ll have to make these for my mom, she’ll love them! These are going on my Easter buffet table. Just delightful. Once again I wish for my hand to reach in and have one right now! Ouch…all I did was hurt my hand. A great Easter/or Spring treat!! These just look too good to resist. Mmmm those look yummy! I love anything with cream cheese frosting! 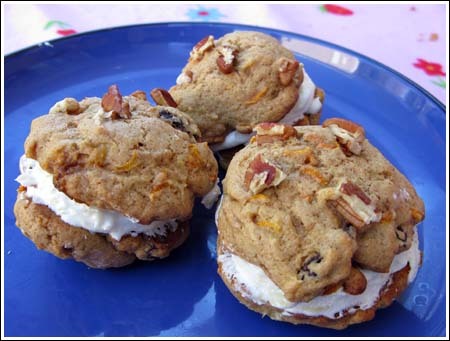 When I made the low fat carrot cookies, I spread 1 t. cream cheese on the top of one. Not the same, but still was good in it’s own healthful way. And darn it, Anna, I told you I made the Rocky Ledge Bars and that I wasn’t going to “splurge”. I did taste them and they are GOOD. It will be hard to resist them. I’ve only cut half the pan and will promptly be putting the rest in the freezer or giving them away. YUM-O! Sharon, I just gave the rest of these to my friend next door. Erin, icing sugar is just another name for powdered sugar (confectioners’ sugar). I think the lady who posted the recipe is Canadian and I believe “icing sugar” is a term used in the UK and Canada. Can you tell me what icing sugar is and where you purchase it? The recipe looks wonderful. Thank you!